Google Messenger is a solid SMS app and the various rumors have made it seem like Google wants it to be the primary option for SMS messaging on Android, but it's unclear how that will turn out. In the meantime though, Google has been updating the app, and has added a new feature that may not be that useful for too many but could be great for some. The newest version of Messenger has a new option to allow you to manage messages that you have saved on your SIM card. Of course, there's no way to actually save messages onto a SIM card. The aim of the feature appears to be for those out there who still have SIM cards from old devices and want to access messages saved on the SIM. And, when we say an old device, we mean really old, because the option to save messages onto a SIM hasn't really been necessary since phones had reasonable amounts of internal storage. If you're in that select group, Messenger will now allow you to see the saved messages on a SIM card and will also allow you to delete those messages. Otherwise, there's not much else to do. 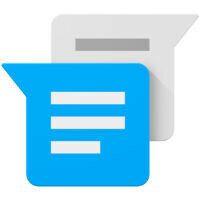 I like Google Messenger for it's design and simplicity. Solid for SMS. But it absolutely fails for MMS. Sometimes sending, sometimes not. Sometimes receiving, sometimes not. Wish they would fix the MMS issues. Maybe they have, I haven't looked at it in a few months, been having to use Textra. I've had the exact same problems with Googles app and MMS on my GS7E. I quit using it and started using Samsungs own app and it works perfectly. Same could be said when sending sms. It sometimes sending failed while the other end receives the message. I always revert to my trustworthy Textra. You are not the only experiencing these problems, and sometimes hangouts same issues. Why switched to textra. Textra for me. Very fast, very clean, feature rich for its size. Idk why Google messenger dont want to support multiple SIMs. They do. Google messenger is the default sms messenger in Android One devices. I don't want to store contacts on the SIM! Always good to save on Gmail, rather than sim. If you lose your sim you've lost all the numbers.